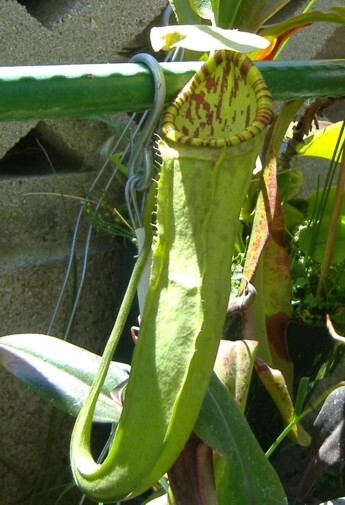 Nepenthes X Isle de France is a complex hybrid. I got this one as a cutting from the Leilani Hapu'u Nursery. They list the parents as Lecouflei X northiana X maxima (Mixta var. sanguinea). I've seen this hybrid around for a while and I kind of liked it. The problem is that it has mostly lowland parents in it and that would make it difficult to grow outdoors as a highlander. Surprisingly it has pitchered and is doing great. It has taken temperatures into the 40's without problems. So maybe it can tolerate wider temperatures than I thought. Most growers I know grow it as a lowlander and they find it extremely vigorous. Cuttings seem to be available on the internet at reasonable prices. I'm going to continue growing it outdoors and see how it does even in my winters.